Crix Madine was an Imperial Army officer who formed and led the notorious Storm commandos of the Imperial military. 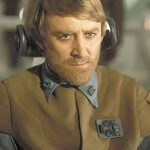 In light of later missions, such as releasing a plague on Dentaal, Madine defected to the Rebel Alliance. After several complications in his defection, Madine became a valuable part of the Rebellion, advising and leading commando operations. He also planned the successful commando raid on the second Death Star’s shield generator. After the Battle of Endor, Madine continued to serve in the New Republic.